Tower Docks are the ultimate in pole dock designs. Suitable for many of the same conditions as a Pole Dock, a Tower Dock has the added benefit of lifting out of the water like a drawbridge at the end of the season. No more getting wet with the annual install and pull out! 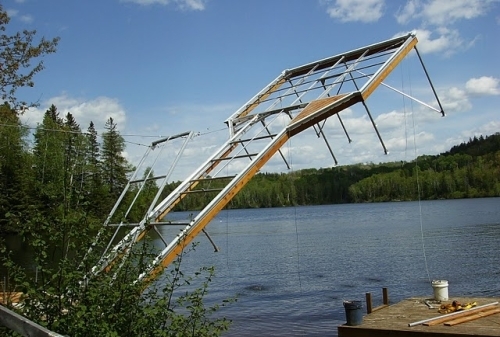 The tower component is built right into the frame so there are no heavy components to store away, and the tower folds underneath the decking in the summer leaving your dock clean and ready for use. Every Designer Series Tower Dock is hand crafted by experienced welders using the highest quality Canadian materials at our factory in Muskoka. Each system features a welded marine grade aluminum frame and stainless steel fasteners to ensure your system will last a lifetime without rusting. The dock has deck support sleepers every 16″, supporting almost any type of decking you choose to use. 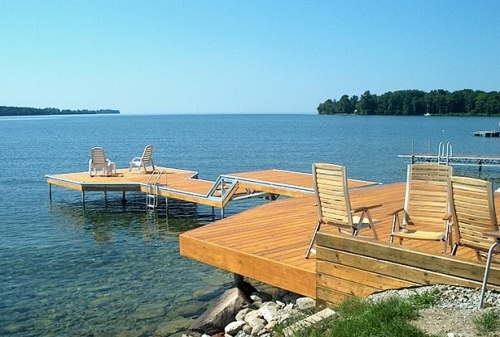 Docks are available as frame only or with Western Red Cedar, Solid PVC or Aluminum Decking. Our exclusive deck panel clips clamp decking securely to the frame. The length of your tower dock is typically based on the water depth. How far out do you need to go to be in deep enough water to dock your boat or to swim? Tower docks are available in 20′, 30′, 40′ & 50′ lengths. Additional length can be added as a standard removable pole dock. Widths incude 4′, 6′ & 8′. Wider docks are more stable in deeper water and also more comfortable to use. Tower Docks are available in either straight out, or T shaped designs. T Shape – A 10’x15′ Patio is available to create a T Shape. The patio creates extra seating space for entertaining. Hidden Leg Design – Keeps the dock legs hidden below the decking creating a clean, attractive appearance. Cedar Skirting – Creates a wood dock look by running cedar below the dock frame. Anti-Sway Bars – Removes sway in deeper water. Bumpers – Protect your boat and enhance the appearance of your dock. Multiple styles and colours available. Cleats – Secure your boat to the dock. A variety of styles available including flip up cleats that are easy on your toes. Swim Ladders – Straight & Angled ladders available in 3, 4 & 5 steps. Solar Lights – Decorative accent lights make your dock visible at night and create a great finishing touch to your design. Tower Docks are perfect for situations where winterizing is done by one person. Deck panels are removed, cables attach and the dock is winched up and out of the water. Winter Cables are attached for additional safety from high winds. 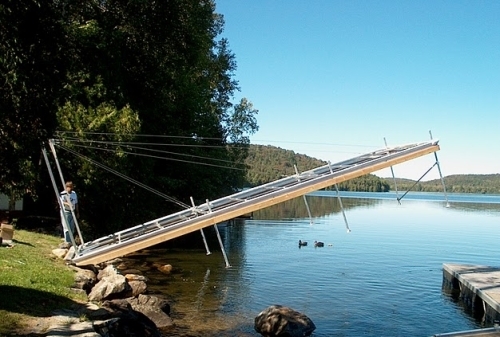 Tower Dock Installations are somewhat custom based on your shoreline. A site inspection is usually performed during the quote stage to ensure you get everything you need to make your new Tower Dock last a lifetime. Most clients choose to have their Tower Dock installed professionally the first time to ensure it is done properly and can winterize it from there on their own.